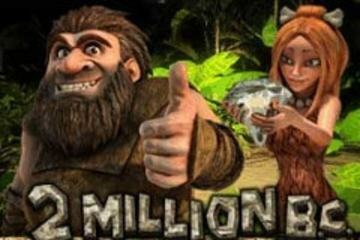 The 2 Million BC slot machine game has a Flintstone-style theme and offers loads of special features that are ready to be discovered. The feature-rich nature of the game means that players will be kept interested for longer. We have had feedback from visitors, saying this may be one of the best online games to play. How far back through history is enough to find a compelling slot theme? The good people at Betsoft have gone way, way back - to a period of 2 million years B.C. to find interesting characters and lucrative slot solutions. The 2 Million B.C. slot game has 5 reels and 30 paying lines and allows you to meet a hairy cave-dwelling ancestor on the side of the reels, hopping with joy every time you score a win. The 2 Million BC game is referred to (by the company that makes it) as a 3D video slot, because of it's animated graphics. As with many new slot machines, this game has free spins bonuses to keep you amused as well as interactive mini-games. Among the loads of heavy 3D graphics you’ll experience fine animation; after all, that’s what Betsoft does best. All the control buttons and adjustment scales are made to fit the theme. The Bet Max Spin button is a bonfire, and all the other buttons (Spin, Bet per Line +/-, Select Lines +/- and Choose Coin) are stones and rocks. All the symbols fit the theme, as well. You won’t see any playing cards anywhere near this 2 million years B.C. settlement. From the lowest of values to the highest, the symbols include: a red jewel, a primitive pottery vase, a drawing of a mammoth, a necklace made of pebbles, a club, a stone wheel, a stone monument, a yellow flying dinosaur, a sabre-toothed tiger and a cave girl. The interesting thing about 2 Million B.C. symbols is that most of them will issue a payout even for two of a kind. There are three special symbols, and no Wild. The bonfire acts as a Scatter and triggers freebies, whereas a symbol showing a diamond is responsible for the other main bonus feature in the game. There is also an acorn symbol which triggers the Saber Attack feature. The Autoplay option isn’t lined up with other settings below the reels. Instead you will find it in the left upper corner, beside the Sounds Off control button, shaped as a leaf. It takes as much as 3 bonfire symbols anywhere on the reels to trigger Free Spins, The game switches to nighttime mode and everything darkens. A minimum of 5 and a maximum of 25 free spins are played and all the winnings are credited to the player’s account when the round ends. The Sabre Attacks feature is triggered when the player collects 3 acorns which only land on reel 5. The goal of the mini-game is to stun the sabre-toothed tiger by throwing the acorns at it and as a reward you’ll win instant credits. The Diamond bonus is activated when 3 diamond symbols land a win line. Also a mini-game, it starts with the cave girl asking for help because the tiger has stolen her diamond. The caveman, as a gentleman, will try to retrieve her diamond by attacking the tiger, sneaking up to it or amusing it. The biggest prize is paid if you pick the right option. 2 Million B.C. is one of the most immersive video slots from Betsoft. It has lovely graphics, impressive animation and some rewarding bonus features. Some newer releases from the same company have undoubtedly surpassed it in terms of visuals and sound, but the Stone Age-themed slot stands the test of time. The top payout is worth 500x the stake and the RTP is 91.94%.